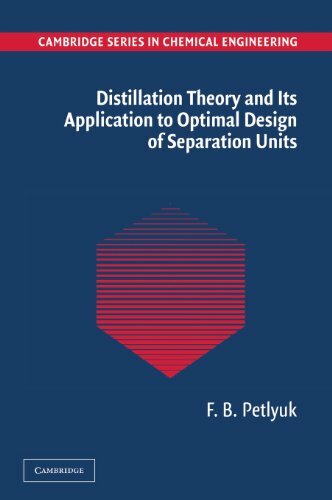 Distillation Theory And Its Application To Optimal Design Of Separation Units (Cambridge Series In Chemical Engineering): 9780521820929 Hardcover - LIMEROCK BOOKS INC. Writing for designers and operators of separation units in the chemical, pharmaceutical, food, and related industries as well as software designers, F.B. Petlyuk presents a clear, multidimensional geometric representation of distillation theory valid for all types of distillation column types, splits, and mixtures. DistillDesigner software allows refinement and confirmation of the algorithms of optimal design. Methods of the general geometric theory of distillation, encoded in DistillDesigner, provide quick and reliable solutions to problems of flowsheet synthesis and to optimal design calculations. This book is intended for designers and operators of separation units in the chemical, pharmaceutical, food, and other industries and for software designers. The author presents a clear, multidimensional geometric representation of distillation theory, that is valid for all types of distillation column types, splits, and mixtures. DistillDesigner software allows refinement and confirmation of the algorithms of optimal design. Methods of the general geometric theory of distillation, encoded in DistillDesigner, provide quick and reliable solutions to problems of flowsheet synthesis and to optimal design calculations.